National Auto Pasco has been providing quality car care in Hudson, FL, since 1985. We are a family-owned business delivering honest and professional automotive repair and auto maintenance services to the people of Hudson and surrounding areas. The quality ASE (Automotive Service Excellence) certified technicians at National Auto Pasco employ today’s latest automotive technology and are equipped to handle all major and minor repairs on foreign and domestic vehicles. *To perform high-quality diagnostic and repair service at a fair price using quality NAPA parts. *To be dedicated to customer satisfaction. *To exercise reasonable care for the customer’s property while it is in our possession.To obtain prior authorization and provide a price estimate for work performed. *To provide a system for fair settlement of customer complaints should they occur. *To maintain the highest standards of our profession. National Auto Service Center Pasco, Inc. has been in business for over 30 years, which is not something many small companies can say today. My name is Harry Bergner. I have worked for the company in many areas over the years, starting as a Master Technician in 1984 and working my way up to Store Manager, General Manager and then to Vice President and finally owner. 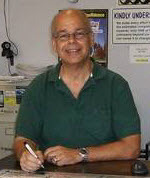 I have been the proud Owner of National Auto Service Centers in Pasco County since 2007. Our Hudson store is a AAA Approved Auto Repair Center. I have been a Pasco County resident for over 20 years and I like to invest in my community. Many of you have been to our locations before and I would like to thank you for your patronage; it is really appreciated. We are a full service auto repair shop and tire dealership; very ready and able to help you with all your automotive needs. We look forward to meeting you. Come by and have a cup of coffee and check us out! Honest, competent auto repair, locally owned and operated! AAA Approved Auto Repair Shops give you peace of mind with the great features listed below. Check out all of the great benefits you can receive from a AAA Approved Auto Repair Shop.